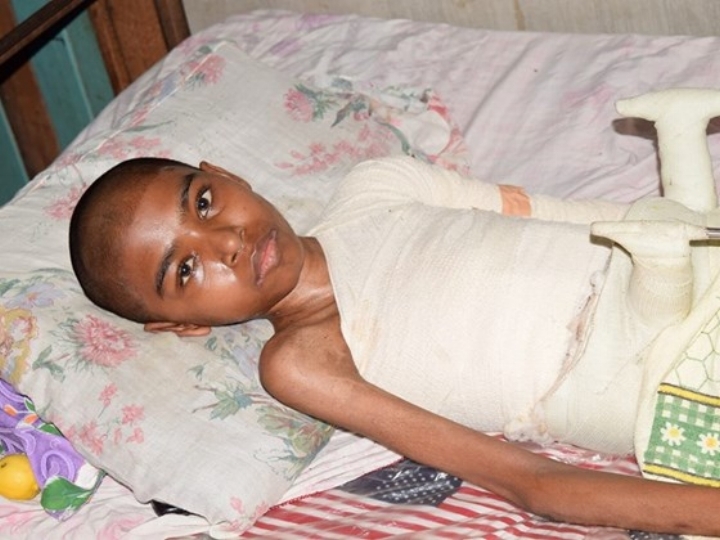 On June 17, 2013, a then 12-year-old Bhojpaul Ramjas was admitted to Georgetown Public Hospital Corporation (GPHC) with deep flash burns to 36% of his body. Eleven hours prior to being admitted, Bhojpaul was beaten by some older boys who bullied him into climbing a light pole and touching a live electrical wire. He was burned down to the bare bones in some areas of his body. Bhojpaul was treated at the hospital and sent home after several months; however, due to inadequate home care and lack of local medical treatment, he had recurring infections which was eating away at his already fragile body. So, he laid in his bed and waited for either a miracle or death. This child suffered beyond the stretch of words until his aunt visited from the United States and started a campaign to help him. The SHEA Charity was contacted on September 8, 2015, and we immediately began working in conjunction with the child’s aunt, Camille Ragnauth, to find treatment services to save his life. Several hospitals responded to our request for treatment, but most of them required upfront payment which was estimated at well over $300,000.00. We then started an online crowd-funding campaign to help offset some of the expenses. Fortunately, through much networking we were able to find a hospital to accept the child on a pro-bono basis. Within one month we were able to facilitate his treatment services; secure medical visas, travel arrangements, housing, and meals. We also raised $7,000.00 in cash through the online fundraiser, which paid for most of these fees with the exception of his medical cost. On March 7, 2016 Bhojpaul returned to Guyana a brand new person. He is well on his way to recovery as he is now pain free and able to walk; something that he was not able to do for approximately 3 years. His return travel to Guyana was sponsored by the Shri Devi Mandir Global Humanitarian Foundation of New York, led by Pandit Tillack Seerattan. The Mandir has also pledged to cover his travel costs for a follow-up visit to the US in August of 2016. Bhojpaul returned to the US in August of 2016 for followup burn care and after completing a five week session, he was sent home to heal and recuperate. His road to a full recover is a long, challenging one; we wish him continued good health, success, and bright future ahead.